Back in late October, production got under way on John Wick: Chapter 2, which brings back Keanu Reeves as John Wick, along with a number of returning stars and new cast members alike. In December, news that Keanu Reeves' The Matrix co-star Laurence Fishburne joined the cast got lost in the Christmas/Star Wars: The Force Awakens shuffle, although not much was revealed about the character he's playing. During a new interview with IGN, Keanu Reeves shed some light on his co-star's character, along with Peter Stormare's new role. "Laurence has this fantastic role as a character in the Underworld called The Bowery King. He plays such a great character in the piece and he brings of course humor, intelligence, charisma and fascination - he's such an incredible actor and it was a pleasure to work with him again. And Peter Stormare - Stormare has more of a cameo in it but again he brings such fun and mystery and this mixture of groundedness and the surreal." Other new cast members in this sequel include Common as the villain, Ruby Rose and Riccardo Scamarcio. Common's character is described as the head of security for a female crime lord, but no details have been given for Ruby Rose and Riccardo Scamarcio's roles. Also returning from the original action-thriller are Ian McShane (Winston), John Leguizamo (Aurelio), Bridget Moynahan (Helen), Thomas Sadoski (Jimmy) and Lance Reddick (Charon). When asked about the story for this follow-up, Keanu Reeves had this to say. "For us it was just what is the next chapter? What is the continuation of this story? Opening up the world - the underground world. The world behind the world in terms of the assassins. Kind of evolving the action - if the first one was a black belt, then this one is third degree black belt. It's such a fun project and a great character." It was previously confirmed that the story is set in Rome, with Chad Stahelski, who directed the original John Wick with David Leitch, returning to take the helm on John Wick 2. Both filmmakers had planned to tackle the sequel together, but they decided to split up for the time being, with Chad Stahelski taking on the sequel and David Leitch directing The Coldest City, which has Charlize Theron set to star. 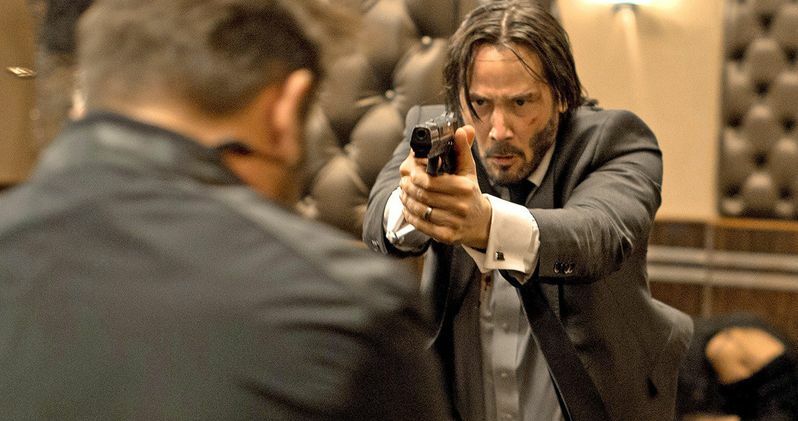 John Wick writer Derek Kolstad returned to write the script. Lionsgate recently issued a February 10, 2017 release date for John Wick: Chapter 2, putting it up against Universal's Fifty Shades Darker, which started production earlier this week, Warner Bros.' The Lego Movie spinoff The LEGO Batman Movie and 20th Century Fox's drama The Mountain Between Us. What do you think about these new John Wick: Chapter 2 details?